Thirty years ago, on 28th July 1986, Suzy Lamplugh, a 25-year-old estate agent, disappeared in broad daylight in the middle of the day while showing a client around a house in Fulham. The Suzy Lamplugh Trust was born shortly after Suzy’s disappearance and over the past 30 years it has sought to keep people safe from violence and aggression. 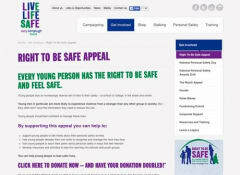 Milestones achieved by the charity include: campaigning for private hire vehicle licensing in London, being instrumental in bringing about the Protection from Harassment Act 1997 which dealt with stalkers, producing an award winning video about safe independence for young people and setting up the National Stalking Helpline. This was the world’s first specialist service dedicated to supporting victims of stalking. The Trust has also delivered personal safety training to over 50,000 people since its inception. A lot has been achieved, but there is more to be done. In its 30 th year the charity is shining a light on violence and aggression in the workplace and personal safety of young people, two of the areas that particularly inspired Paul and Diana Lamplugh to start the Trust in Suzy’s name. Latest figures from 2014/15 show that 142 people were killed at work and 76,000 injuries to employees were reported. Mental health issues including stress, anxiety and depression, gave rise to the most working days lost and the most common physical or psychosocial risk cited by two thirds of workplaces was ‘dealing with difficult customers, patients and pupils.’ This was placed higher than risks such as lifting, chemical substances, slips, trips or falls and machinery. We cannot afford to be complacent about personal safety in the workplace. The Trust continues to work to improve safety for all workers through education, support and campaigning.